Newsweek has never been a stranger to controversial magazine covers, but it outdid itself with Muslim Rage and its attendant hashtag. 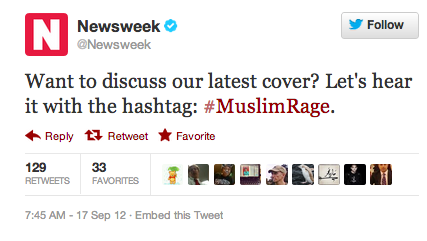 After asking Twitter to weigh in on the story using #muslimrage, commentators quickly reclaimed the hashtag, making jokes about how frustrating it is when you leave your shoes at the mosque or when a restaurant forgets to put garlic sauce on your shawarma. As Tweeters used the hashtag to poke fun at everyone from Mitt Romney to muslin (the fabric), the joke was ultimately on Newsweek. Yes, they got an entire social network to talk about them for a day, but this shameless play for pageviews was just another step in the now-defunct magazine's loss of legitimacy. Lesson: Not everything has to be a hashtag. The original headline was bad enough, but by letting it out into the wild, things spun out of out of control and compounded the embarrassment. McDonald's has for many years promoted the idea that their restaurant is a place where families grow together and where workers jumpstart great careers. Whether or not this is true is up for debate, but there's definitely a perception that McDonald's is more like a dead end for both its customers and its employees, where pulverized meat parts are served to the lonely, the hung over, and the weary. 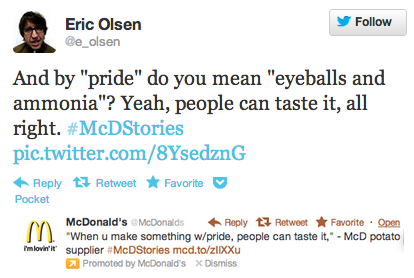 So when it launched the #McDStories hashtag, it also launched a barrage of snarky, scatological comments about all the disgusting experiences to be had at McDonald's. Lesson: Know your audience. People go to McDonald's because you sell double cheeseburgers for a dollar, and kids like your toys, not because families want to build memories. And while the family-growing-together vibe might work in television spots, it doesn't work so well on Twitter, where McDonald's can't control the message. Out of context, this Tweet doesn't seem so bad...until you realize it was sent on Martin Luther King Jr. Day, and the "dream" it's referring to is the dream of racial equality from Dr. King's "I Have a Dream" speech. Racial equality is maybe just a little more significant than your tacos, guys. Lesson: Don't compare your product, even in jest, to a significant public figure or event that has nothing to do with you. Brands always use things in the news when promoting products, but some timely topics are better left unmentioned. Or, if you're going to mention a catastrophe like Hurricane Sandy, be a decent human being and show some empathy for the victims. American Apparel, the Gap, Urban Outfitters, and Groupon are just a few of the brands that name-dropped Sandy in jokey promotional Tweets. American Apparel Tweeted a “Hurricane Sandy Sale” to those “bored during the storm.” The Gap Tweeted, “We’ll be doing lots of Gap.com shopping today. 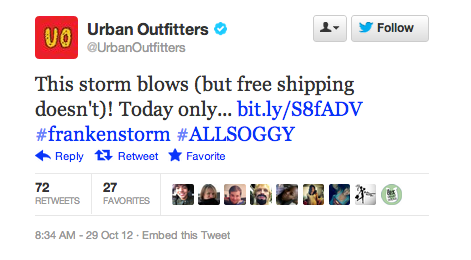 How about you?” And Urban Outfitters Tweeted, “This storm blows (but free shipping doesn’t).” Their social media producers probably didn't realize the severity of the storm yet. But before all the facts are in, brands should take Adam Penenberg's advice: "For a business operating at a time of crisis, the soft sell is good; the hard sell, bad." Lesson: It sounds obvious but apparently it isn't: Don't make light of natural disasters. Any social media producer knows the dangers of linking your personal and professional accounts in the same interface (software like Tweetdeck allows you to switch between accounts with the click of a mouse). That's what likely caused the above Tweet to be sent from @KitchenAidUSA's official account. It was an honest mistake, and as someone who actively Tweets from both my personal account and the main PandoDaily account, I can sympathize with it. Nevertheless, it's important for brands to hire social media producers who maintain a base level of professionalism on their personal feeds and who don't bring candidates' deceased relatives into their political commentary. Lesson: Use different interfaces for your personal and your professional feeds. Also, don't hire knuckleheads. Only a few hours after the tragic shooting last July in a Colorado movie theater, an official account associated with the National Rifle Association Tweeted, "Good morning, shooters. Happy Friday! Weekend plans?" Few Americans, let alone those on Twitter, could have avoided the news coming out of Colorado that day, so let's charitably assume that the Tweet was written the night before and auto-scheduled for that morning. 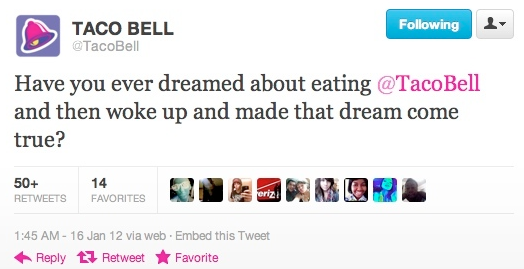 Still, the Tweet was kept live for nearly three hours before it was finally deleted. Lesson: Don't preschedule auto-Tweets. I know it's tempting, but just don't do it. This Tweet takes the top spot over the NRA debacle because while the NRA Tweet was probably auto-Tweeted, Celeb Boutique's "#Aurora is trending, clearly about our Kim K inspired #Aurora dress ;)" could not have been pre-written. In its apology, Celeb Boutique swore that its social media firm is not US-based, but that's a feeble excuse. Things trend for a reason, and you should always research a hashtag before using it. Lesson: Always check why something is trending.